These are our original springer plans. We modeled them in 3D CAD and reviewed the design with several experienced builders. One of the objectives was to design a good looking springer that could be built in a home shop. The components are over-engineered for safety. To build this fork you need a way to cut , grind and drill steel plate. You’ll need to be able to weld, both TIG and MIG will get the job done. Hundreds of home builders have built this fork. At least three different companies sell springers based on our design. It’s proven and it works. You’ll spend about $100 on hardware and perhaps another $120 on steel. All of the hardware is available through McMaster-Carr, we include their part numbers so you can order it on line. 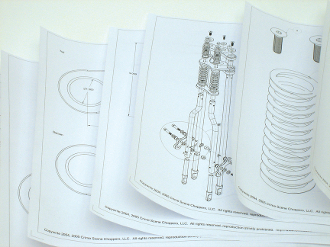 The plans are 19 pages long, printed on 11″ × 17″ paper for easy maneuverability in the shop. All of the parts that need to be cut out of plate are shown full scale so it’s easy to layout the parts for cutting. This item measures approximately 11.0" wide X 0.0" deep X 17.0" high.